Besides Alex Smith's leg (RIP), we finished another NFL week without major injuries. Nothing much has changed: the Saints continue to roll over opposing teams, the Buccaneers can't settle on a QB, and a kicker (Tennessee cough cough) struggled out of nowhere. A few players broke out this week, and with the fantasy playoffs coming soon, owners might be looking to shore up some potential league winning players. Here are a few to consider this week. 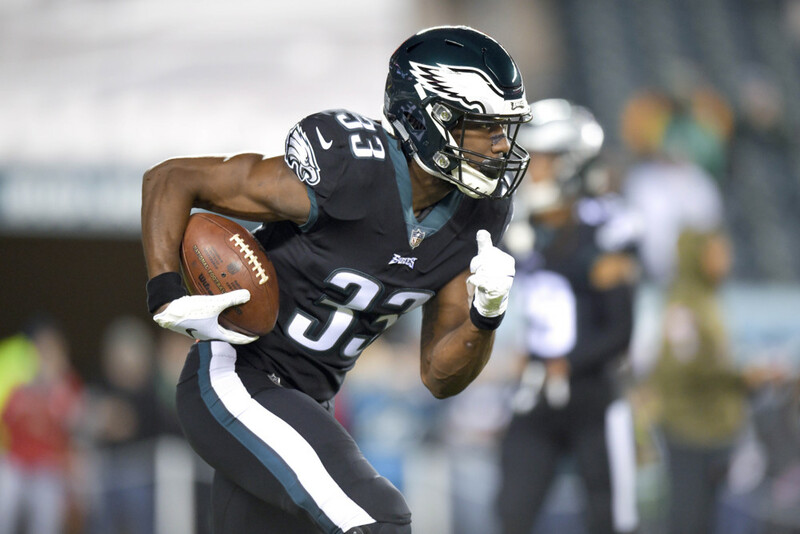 Josh Adams once again led the backfield in Week 11, carrying the ball 7 times for 53 yards and 1 touchdown. He also caught 3 passes for 19 yards. This might not seem like much, but that's mostly because game script called for the Eagles to pass a ton all game. With the Eagles down early, Adams didn't really have a chance to carry the ball. That should change in the next few weeks as the Eagles take on division rivals the next 3 weeks (Giants, Redskins, and Cowboys). Adams has looked like the best running back in Philly, so he should see even more work. He should be owned in 12-14 team leagues. It's been a while since we've had a who?! moment, but RB Gus Edwards burst onto the scene in Week 11. He rushed 17 times for 115 yards, 1 touchdown, and a two point conversion. Edwards looked miles better than the incumbent running back tandem of Alex Collins and Buck Allen. It could be a fluke, but at this point Edwards should be given a chance to lead the backfield in Week 12 against the Raiders. The Ravens have a pretty easy schedule rest of season, facing the Raiders, Falcons, Chiefs, and Buccaneers in the next 4 weeks. Edwards should be added in 12-14 team leagues. Tre'Quan Smith has flashed twice this year, once in Week 5 against the Redskins and again in Week 11 against the Eagles. He caught 10 passes on 13 targets for 157 yards and 1 touchdown. Smith has shown tremendous upside so far the last 6 weeks, but between huge games he let fantasy owners down. He even had a 0 point game last week against the Bengals (when the Saints put up 51 points). He is a risky add, but the Saints have now put up at least 40 points in 6 of 10 games. He should be owned in 12-14 team leagues and gets a swiss cheese Atlanta defense on Thanksgiving. Well the start/bench game of quarterbacks in Tampa Bay continues. Ryan Fitzpatrick was once again benched in Week 11, allowing Jameis Winston to get another crack at the starting position. He completed 12 of 16 attempts for 199 yards, 2 touchdowns, and 1 interception. He led the Buccaneers back (a la Fitzpatrick a few weeks ago) and almost beat the New York Giants. Winston hasn't been great this year, but the reason both he and Fitzpatrick are constantly on this waiver wire is that, when they are good, they are great. The Buccaneers' defense still stinks, so they have to throw early and often. Winston gets an easier matchup against San Francisco next week. Just make sure he is actually starting before picking him up. Lamar Jackson led the Ravens to a victory in Week 11, but mostly through his running abilities. Jackson rushed 27 times for 117 yards. He also completed 13 of 19 attempts for 150 yards and 1 interception. Now Jackson might not get 27 rushes every week, but there is no doubt that the Ravens designed the game plan around the rookie QB. Jackson gets another easy foe next week when the Ravens take on the Raiders in Baltimore. Just as Winston, check to see if QB Joe Flacco will play before adding Jackson. Welp, if you've listened to me the last two weeks, you are probably pretty mad at me. (Jets and Titansoof) But I'll give it one more go with a bit more of a solid defense this week. The Redskins have had a sneaky good defense this season, and continued that in Week 11 against the Texans. The Redskins recorded 3 sacks, 2 interceptions, and 1 fumble recovery. They have a bit of a tougher schedule ahead, traveling to Dallas and then to Philadelphia, but the Redskins have been rather matchup proof (besides the games against New Orleans and Atlanta). Third time's a charm?